When I made this shot, I thought it was about the bronc rider and the horse. Turns out I was wrong: it was actually about the row of cowboys back there, behind the pens, paying careful attention to that eight-second ride. 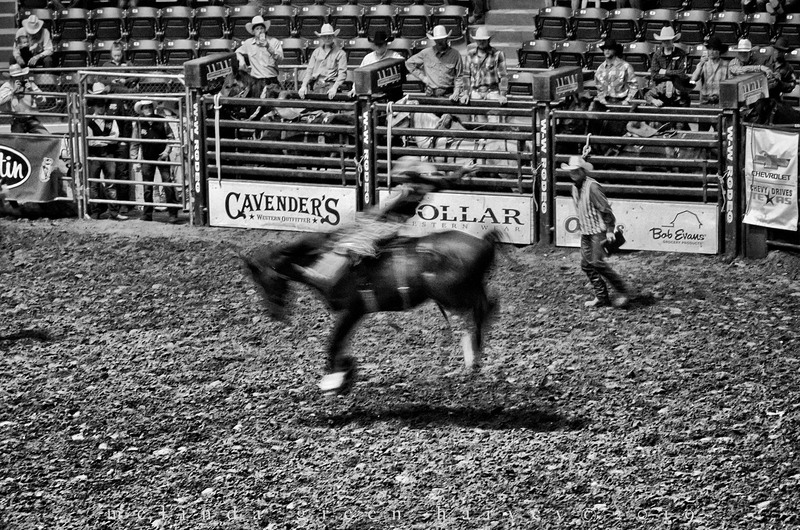 Posted on April 12, 2019, in Photography and tagged 365 photo project, black and white photography, bronc rider, cowboy, learning to see, lubbock, lubbock texas, melinda green harvey, monochrome, one day one image, photo a day, photography, postaday, rodeo, take time to look, texas, thoughtful seeing. Bookmark the permalink. 9 Comments. Indeed it is. I actually enjoyed attend the rodeo, which came as a big surprise, as I was prepared to by cynical. The way I look at things like this, is that even though it may not be a big deal for me, it’s a big deal for someone. That makes it a big deal. So I go with my eyes open in an effort to see what the big deal is. Yes – that is exactly the right attitude! I became transfixed at the rodeo thinking about the dangers of those rodeo events, and how they were being done in the safest possible conditions, with dirt to land on, and rodeo clowns, and other support of the riders. And then, thinking about real-life rodeo things, when instead of soft-ish dirt, there’d be mesquite and cactus, and snakes, and etc. And no help from rescue riders. Or clowns. And no EMS right there in case something goes wrong. Not unlike the Olympics past and present. Great motion shot, and you’ve kept the guys in the distance nicely sharp…. There’s a pretty good chance that the sharp parts and the blurry parts just happened. Just to be clear about my particular abilities.